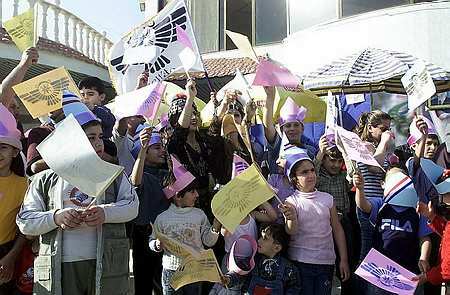 Assyrian children wave the Hoshana palm tree branches in celebration of the Palm Sunday in Baghdad, Iraq. Froggy Boss "Conned People into Making Money"
Why is Linda George Missing from the List? Friday, 3rd of April 2004 a special Seminar about the Christians of Iraq was held at the School of Oriental and African Studies, University of London. The Seminar was the initiative of Dr. Erica Hunter of SOAS and Cambridge University in conjunction with the British School of Archaeology in Iraq and The Anglican and Eastern Churches Association. Dr Erica Hunter has travelled to Iraq extensively and worked with the Iraqi Museum in numerous excavations. Her thesis was rendered on the Assyrians of Hakkari especially the Assyrian Amulets (Ktiwyateh). The Seminar enjoyed a good attendance, I am happy to inform you that a few Assyrians of London had attended. The first half of the Seminar centred on the theological dogmas of the early church fathers, and was chaired by Dr. Suha Rassam. The speakers presented very stimulating paper’s, Prof John Healey’s (University of Manchester) paper was about the early history of the church of the east, and its missions in the Gulf. I found his reply to one of the questions very interesting: a curious attendee asked “if the missionary zeal of the early church fathers was the result of Islam’s tolerance of Christianity”? Prof Healy’s analyses was very coherent, he said, “I doubt if that was the case because Islamic law prohibited any missionary work in Mesopotamia, and I think maybe that this was the reason, as to why we see the missionary work of the church expanding out side of Mesopotamia”. Dr. Erica Hunter’s paper was very enlightening; she spoke about the latest archaeological revelations which attest to the Christian origin of Hira and other southern Iraqi regions, such as Kufa and Najaf. She was followed by Prof. Amir Harrak (University of Toronto, Canada) whose paper was fascinating. Prof. Harrak talked about the last excavations rendered in Tekrit the birth place of the now ousted tyrant. He presented some slides of the churches, monasteries, tombs of saints and Syriac manuscripts which were unearthed in Tekrit. Apparently the Tekritian abbots had reached Egypt and purchased a monastery there, which became to be called the monastery of the Tekritians. Could it be that Tekrit (Teghrit) adopted its name from these Taghareh (Merchants) which travelled to Egypt? Dr. Heleena Murre Van De Berg’s was excellent because it dealt with the identity of the Iraqi Christians and the emergence of Assyrianism. This was welcomed by many because usually the Christians of Iraq are only referred to as Christians and their ethnicity ignored. Dr. George Kiraz concluded the first half of the Seminar with a presentation on The Syriac Digital Library Project, the effectiveness of the archiving system used by the institute mesmerized all the attendees. The second half was chaired by Dr. Erica Hunter. This part of the Seminar dealt with the current situation of the Iraqi Christians. The priests of the four Syriac speaking churches were present and each delivered a speech about their respective church. Rev. Dr. Khoshaba Georges of the Ancient Church of the East presented a paper on both the Julian and Gregorian Calendar groups, and he was followed by each of Rev. Habib Al-Nawfali of the Chaldean Church, Rev. Toma Daood of the Syrian Orthodox Church and Rev. Safa Habash of the Syrian Catholic Church. The last paper was presented by Prof. Geoffrey Khan (University of Cambridge), whose paper revolved around the Christian Neo-Aramaic dialects of Iraq. To the Assyrians, his paper was very interesting because he referred to some terms, which the new generations have almost forgotten, they seemed to resonate unique nostalgic feelings. The closing remarks were given by Sir Harold Walker who was a former British ambassador to Iraq, ironically during the most turbulent phase of Iraq’s and British relations. Enclosed is the paper presented by Rev. Dr. Khosahaba Georges, please note that he is only speaking about the situation of the Church in Iraq and not including that of the Diasporas. I would like to seize this opportunity and thank SOAS, especially Dr. Erica Hunter and Dr Suha Rassam for initiating and organising such a seminar; which to us is of paramount importance. I will present a brief paper on the Christians of Iraq specifically the Church of the East. The roots of this glorious church extend to the first century, however, many believe that this church was first crystallised at the synod of Ephesus of 431 AD while others are resolved that this church was first initiated at the synod of Dadishu of 424 AD. But neither is true; the church of the east held the Christothokos doctrine before Nestoreus had began teaching this believe. We were only called Nestorians because we did not regard Nestoreus’s teachings as heretical. Also the synod of Dadishu was not when our church was formed but when an urgent synod was held to convince Mar Dadishu to withdraw his resignation, and when our church restored its independence from the Western Churches . Hence we prefer to be known as the Church of the East ecclesiastically and Assyrians ethnically. It is impossible to separate religion and race in the case of the Assyrians . Hence both secular and religious history will be discussed. The modern demography and to some extend geography of Iraq was shaped by the Centralisation policy of the Ottomans whose empire became to be known as the sick man of Asia. The other phenomena that gave Iraq its current form were the richness of this land’s resources that attracted the attention of the Western or European Powers. France Russia and Britain all tried and challenged each other to penetrate through the oppressed Christians with promises for a brighter future, while equally supporting the High Port to strengthen his grip on the Asiatic part of his empire and the independent millets that populated that area. 1. The conversion of the Christians of the plain in to Catholicism; this long time ambition of Rome crystallised in 1844 when those that became Catholics where officially recognised as the Chaldean Millet. This was achieved through the mediation of the French consul with the Sultan . 2. The atrocious massacres of the mountain Christians by the Kurdish Turkish coalition under the leadership of the notorious Bedri Khan Beg. Through these massacres the Mountain Christians were slaughtered indiscriminately, their hamlets and centuries old monasteries where reduced to ruins, their precious and priceless manuscripts destroyed forever and lost, and the forced conversion of the captives to the faith of Islam . Through these massacres the mountain Christians become destitute. This enabled the western missionaries to further extend their influence and utilise these vulnerable Assyrians to protect their own interests in this oil rich piece of land. 3. The emergence of Briton as the prominent power in the area, especially during and after the World Wars. When Iraq became a British mandate. The 1926 Lausanne treaty, which replaced the Sevres Treaty, gave Iraq its current frontiers, 1932 Iraq became a member of the League of Nations and an independent and sovereign state. All through the negotiations of the armistice and the peace conference, the settlement of the Assyrians remained an unsolved issue: here I would like to quote Milt Khoobyarian: “As for the Assyrians who were evicted from their homelands would remain as displaced people. Indeed Churchill was correct in referring to the members of this conference as the ‘Forty Thieves’ . In fact immediately after the admission of Iraq to the League of Nations the Rashid Ali Gilani’s government was resolved to end the Christian question in Iraq once and for all, exploiting the opportunity of the King Faisal’s absence who was receiving medical treatment in Switzerland. In August 1933 and not even a year after Iraq had joined the League of Nations; over two hundred and fifty articles were published in Iraq’s official newspapers and magazines calling for Jihad (holy war) against the Assyrians which were referred to as the Christian infidels of the north . This resulted in a wholesale massacre, young and old, men and women were slaughtered in groups. Priests were dragged by their beards and ridiculed in public before they were decapitated. According to LT. COL. Stafford: “When the League of Nations Council met in November 1933 the question of the Assyrian massacres appeared on the agenda. The Iraqi delegates put up their case -that represented in the Blue Book prepared by the Iraqi Government. They admitted that excesses had been committed by regular troops, and stated that these excesses, whatever the provocation, merited and received severe condemnation. Sir John Simon said the same thing. He said that any attempt to apportion the blame was beside the point. What was essential was that the future of the Assyrians should be safeguarded. Both the British and Iraqi Governments were convinced that this could only be done if the Assyrians could be found new homes outside Iraq”. 1. Parallel to this denunciation the Army General “Bakir Sidqi” who implanted the resolutions of this massacre was paraded in the capital as a patriotic hero and decorated with the state’s highest emblems. 2. Both Iraq’s and British government’s proposal to end this conflict is truly offensive to the Assyrians as a people and to the honor of both state that of Iraq and Briton. According to their proposal this miserable fate could only be prevented in the future, if the Assyrians, a people so indigenous to this land, could be found new homes outside of Iraq. This tragic event not only remains a red stain in the history pages of modern Iraq, and the Western Allies who did not attempt to prevent these atrocities but it must be an example for all the democratic powers who must now attend to the plight of the Iraqi Christians in order to prevent such occurrences taking place in a future Iraq that we all aspire to build. During the early years of the Ba’athist rule, the Revolutionary Leadership Council issued resolution 251. This granted all the speakers of Syriac their cultural rights. 1. To sow the seed of division and to deepen it further among the people of one nation but of different denominations; for they were addressed as Syrians, Chaldeans and Assyrians. Not as one people of the same ethnicity and heritage but as the speakers of a common language and that being Syriac. 2. To prevent the Christians who felt that they were oppressed from supporting and joining the Kurdish uprising. 3. The most important factor was for the Christians to return the favour of this resolution by forming a special Christian force to combat and put down the Kurdish Peshmerges. Despite its negative intentions the Christians exploited this resolution and published numerous periodicals, established radio programmes and social clubs. However, the resolution was withdrawn when it became overtly clear that it was not serving the government’s intended policy; which was divide and rule but in fact it was getting the people of one nation closer together who would soon aspire for a brighter future with further rights. During the brutal sway of Saddam’s state of terror all the Iraqi people suffered tremendously, the Christians who were conscious of their identity and other non-Arab Iraqis though were in worse state. All the Christian schools, churches and monasteries were eventually confiscated and became the property of Iraq’s ministry of religious affairs. Priests were forced to serve army and perform acts that negate the Christian believes and the Ten Commandments. The Ba’athist regime exploited the Kurdish insurgency, to further change the demographic map of the north, and eliminate everything associated with the Assyrian heritage. The Kurds also benefited from this policy for this aided them to be a majority in historical Assyrian lands. When the Kurds were guaranteed a save haven in the northern no fly zone, Mr. Francis Shabo one of the Assyrian representatives in the Kurdish parliament was mysteriously assassinated, many believe that this was due to his constant demands for justice regarding the unlawful expropriation of Christian Lands. This caused the destruction of over 250 villages and their churches and monasteries and the expulsion of their original inhabitants. To conclude I would like to present you with a brief outline of the Church of the East’s current status in Iraq. What I mean by the Church of the East is only what is called today as: Ancient Church of the East and the Assyrian Church of the East; another word both fractions the Gregorian and the Julian calendar. Because there is no official statistics rendered to date we estimate the members of the aforementioned denominations to be roughly around 340,000 faithful served by 115 parishes and missions . They are mostly concentrated in major cosmopolitan cities such as Basra, Baghdad, Kirkuk, Mosul Arbil and Dohuk. With numerous villages in the northern Iraqi regions; like the plain of Mosul, Sapna Berwar and Nahla valley. Currently we only have two monastries which have newly been rebuild; Mar Odishu of dereh and mar Qayooma of Doreh, without any monastic inhabitants. The Gregorian calendar have one archbishop who also acts as a patriarchal representative in Baghdad, and two bishops one in Baghdad and the other in Dohuk. 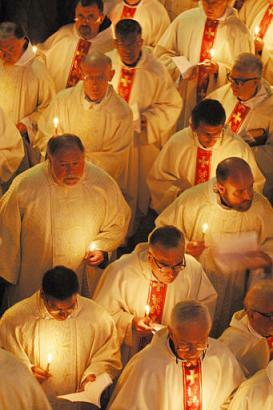 With numerous priests a quarterly magazine called “Kinara D’Rookha” (The Harp of the Spirit). The clergy of both fractions utilise the theological discipline of the Chaldean Theological College of Babil, Baghdad. The Assyrian Church of the East has also started an ecumenical dialogue with the Roman Catholic Church since 1984 which concluded with a Common Christological Declaration signed on 11 October 1994 . And now they have established a Joint Commission for Theological Dialogue (JCTD). (ZNDA: Baghdad) In post-Hussein Iraq, many long-repressed dreams have resurfaced. For Assyrians, who have endured centuries of war and persecution, the goal is simple. Odisho Malko reaches deep inside a living room cabinet for a bundle tightly bound in cloth. Carrying it ever so gently, he undoes the wrapping, revealing a large, timeworn book, bound in thick, dark brown leather that he carefully places on a glass table. Then Malko, a tall, soft-spoken, middle-age man with a pleasant smile, stands back, seemingly in awe. It is almost as if he has revealed an ancient secret in his Baghdad house. Handwritten by a priest more than 200 years ago in a lonely ountaintop village where his family once lived, it is an ancient prayer that is still part of the Assyrian liturgy. "This is very precious," he says, opening the book, a 13th Century prayer written in Assyrian, an ancient Semitic language that, like Hebrew and Arabic, sprang from Aramaic. Because Aramaic was the common language spoken at the time of Jesus Christ, Mel Gibson used it in his movie "The Passion of the Christ." Malko, a professional engineer by training, vowed years ago to help keep Assyrian alive, churning out books and poems and an Arabic-Assyrian dictionary that he keeps updating, dutifully jotting down in blue ink new words for an edition that he says will come out someday soon. It is the language that has bound the Assyrians in the 2,600 years since the fall of their one-time capital Nineveh and the collapse of an empire that had sprawled outward from the Tigris and Euphrates rivers to ancient Egypt and the Caspian Sea. Assyrians in the U.S. have clung to the language through classes at churches and their own organizations. Just barely, however. "If there are no new waves of immigrants, our language would disappear (in the U.S.) in the next 60 years," says Edward Odisho, an Iraqi-born professor of linguistics at Northeastern Illinois University. But the language's fate in Iraq is more hopeful. In post-Saddam Hussein Iraq, long repressed dreams have exploded with a fury among those who still have the spirit to dream. Kurds talk of their own region, safe at last from others' oppression. Shiites, Iraq's Islamic majority, talk of finally practicing their faith freely. Communists, Socialists, Islamic hard-liners, Democrats, feminists, human rights activists -- almost anyone with a vision for Iraq's future -- harbors a hope that they will get their day in the sun. And Assyrians dream of survival. Their numbers greatly reduced by centuries of exile, war and persecution, Assyrians' dreams are not that grand. Their goal is not to become another forgotten footnote to Middle East history, not to lose their foothold in the land, where once they ruled. pressured to take Muslim names. Most Assyrians in Iraq speak their ancestral language, but they learned it at home or at their churches. Only those Assyrians who fled north to the Kurdish enclave set up after the 1991 Persian Gulf war were able to freely study Assyrian in public schools. Nearly 200 Assyrian villages in northern Iraq were wiped out in the government's long campaign against their neighbors, the Kurds. Likewise, Assyrians, who fought the government beside the Kurds were targeted and killed by the regime. Assyrians are Christians in a country where Christians account for only an estimated 3 percent of the population. They say they are not Arabs, a point that has added to theirpersecution. They were massacred by the Ottomans against whom they rose up at the end of World War I. And they faced slaughter in the early 20th Century in the newly independent Iraq, spurring Assyrian leaders to plea with the nations of the world in the 1930s for a new homeland for their people. But none reached out with an acceptable offer, and so many Assyrians continued to embrace a global Diaspora, which early on marked Chicago as a major sanctuary. More than 80,000 Assyrians today live in the Chicago metropolitan area, a place where they first sought sanctuary in the late 19th Century with the help of Chicago-based missionaries, churches and seminaries, and where Mar Dinkha IV, the patriarch of the Assyrian Church of the East, is based. How many Assyrians live today in Iraq is not clear, nor does everyone agree on who is an Assyrian. More than a dozen years ago there were as many as 180,000 Assyrians in Iraq, say Assyrian leaders. But many fled as a result of the wars and other misfortunes, and there has been no official census since, they say. Across Iraq, just 30 Assyrian churches remain, six of them in Baghdad. There are only 12 students in the one seminary run by the Assyrian Church of the East. Early converts to Christianity, Assyrians embrace Eastern Orthodox traditions, unlike Chaldeans, fellow Iraqi Christians, ho follow the Vatican, and whose ancestors broke from the Church of the East in 1522. The division came up recently when Chaldean church leaders, saying they represent most of Iraq's Christians, protested the lack of a Chaldean on the 25-member Iraq Governing Council. The U.S. led occupation forces chose the council to temporarily rule Iraq and its sole Christian member is Yonadam Kanna, an Assyrian. To Archbishop Gewargis Sliwa, head of the Church of the East in Iraq in Baghdad, Chaldeans are members of a church, while they and many other Iraqi Christians spring from the same Assyrian roots. "Let us all live together as Assyrians," says Sliwa, a short, silver-haired man from an office in his church headquarters on a busy Baghdad street. There is no heavily armed presence at the headquarters, an unusual sight in a sometimes terrified and well-armed city. There is only a guard who opens and closes a large metal fence. But the Archbishop does not fret about Assyrians' safety as do others, citing attacks against Assyrians. "As Christians, we do not have to be afraid to live among Muslims," he says. As an example of his confidence, he recalls a meeting in Najaf recently with Islamic leaders there after several Christians, who sell liquor were gunned down allegedly by Islamic hardliners. It was one of only a few meetings that he has ever had with clergy in the city sacred to Shiites and the Muslim leaders welcomed him as well as his plea for them to urge understanding among their followers. "We said, `let's show these fanatics that we embrace each other,'" he recalls. So, too, Kanna, the Governing Council's sole Christian, counts himself as an optimist when it comes to Assyrians in a new Iraq. An outspoken liberal, he talks not only ensuring the rights for Assyrians and Christians, but Iraqi women. Given a death sentence by the government in 1984 for his role in Assyrian politics, Kanna, who was trained as a civil engineer, lived underground until 1991, when he moved to the newly independent zone in northern Iraq set up by the Kurds after the gulf war. There he was a minister in the government created by the Kurds. He is the head of the Assyrian Democratic Movement. The largest of several Assyrian factions, it has temporarily taken over a motley-looking military compound formerly used by the fedayeen or volunteer fighters loyal to Saddam Hussein. And like many political parties, security is tight when entering its compound. "Yes, there have been some small incidents. And yes, there are some people who have tried to stop us, but these are problems in the short term," says Kanna, who goes on enthusiastically about the Governing Council's decision to institute Assyrian language classes in some schools next year. But there's a limit to his optimism. Because he doubts that Iraqis are ready to embrace a full-fledged democracy, he wants some legal guarantees that Assyrians will hold government jobs and elected positions in the future. "If my rights are not guaranteed now, they'll never be," he says, predicting that it will take years before Muslims vote for and support Christians in government positions. Odisho Malko has similar doubts about what Iraq's Assyrians will face unless the Americans exert a guiding hand to ensure their rights before the slated end of the occupation on July 1. But his first interest is furthering the Assyrian language and culture, an effort that he vowed years ago to nurture despite hefty business commitments. He even signed up for university anthropology classes in Baghdad several years ago, so he could become more of an expert on Assyrian history. He lives in a mostly Assyrian neighborhood, where neighbors know precisely where each family lives, and where guests for a wedding at the whitewashed, two-story Assyrian church down the street bring the neighborhood to life on a darkening, late afternoon. Though most Assyrians trace their roots to northern Iraq, decades of violence and difficulties led many to move to Baghdad. On a cluttered living room table in Malko's home are notes for his latest work. It is his first book in Arabic as compared to his others that were written in Assyrian. This way, he explains, all Iraqis will be able to learn about Assyrians. His title: "Assyrians Today." It has become a tradition to celebrate annually our national day, the New Year, on the first day of Nissan (April) . It is a celebration of revival and renewal of nature , an occasion that gives us renewed hope of a better future for our people and country, the future whose prerequisite is an establishment of real democratic secular society based on justice, equality and human rights. The first of Nissan (April) arrives to confirm the continuity of our people’s (Syriacs and Chaldeans) contribution and creativity, passed from one generation to another, throughout thousands of years, and with the renewal and rebirth of nature in every April we add renewed meanings and human values to our civilized legacy . The past year was full of events and developments that shook the region and the world. Some of these events were accompanied with great changes and transformations promising the coming of a new era that will inevitably affect our country, Syria . Hence, it is necessary that the leadership in Syria reconsider and reevaluate the internal situation aiming at strengthening the internal national fabric through the solidification of a real national unity which will be effective only via implementing democratic reforms, freedom of expression and the unleashing of a national dialogue evolving different patriotic political forces with all their national and political spectrum, with an aim of reaching a national common denominator and a new national contract compatible with the nature of the new phase as well as with the balance of active socio-political powers. This should be carried out on the ground of a phased and serious national agenda for reform including the resolving of most national pending problems, such as the democratic freedoms, human rights, ethnic minorities and other problems on the basis of sovereignty and national unity . Amidst these national, regional and international situations the 10th conference of Assyrian Democratic Organization, was held in the homeland in the mid-August 2003. It confirmed the need for more openness in the political arena, on the patriotic and democratic forces in Syria for the sake of activating the national debate and consolidating the political relaxation which the country has witnessed in the past years. Furthermore to develope it in the direction of releasing democratic freedoms, issuing of a new law regulating the activities of the political parties, combating corruption, speeding up the administrative and economic reforms, recognizing the Assyrians as original people in Syria and emphasizing their rights constitutionally ( political , cultural and social ). 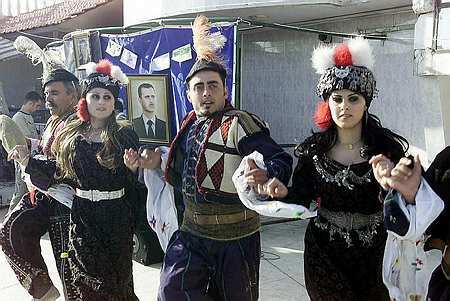 Finally, it confirmed that spreading the culture of fraternity among the various components of the Syrian people (Arabs , Kurds , Assyrians , Armenians and others ) and treating them as real partners in the homeland, for the sake of building a true national unity was necessary to stand up to challenges and external pressures the homeland is currently facing . The tragic events that towns and cities in Syria's al-Jazzire region has witnessed recently claimed the lives of tens of people and the same number of wounded and caused sabotage to public institutions and private property and found its repercussions in other Syrian cities . These events make incumbent on us as Syrians (political forces , government , institutions etc..) to reconsider cautiuosly the true basis for building unity and national identity, far from any unrealistic or extremist expositions and slogans . In term of theses events, the Assyrian Democratic Organization has acted promptly from the outset through playing an intermediary role and holding meeting with various political , ecclesiastical and social parties in order to calm down the situation and put out the turmoil . These efforts alongside many other honest efforts bore positive results in terms of containing the aftereffects of the actions and bringing together the viewpoints among the different parties . In our opinion the best solution for passing by the crisis and its consequent effects is a political solution based on dialogue between the authority and the various political powers in the area and considering what has happened as bygone but instructive lessons must be drawn from that in order to lay a new foundation for a real national unity in the Syrian al-Jazire region, the land of prosperity, history and civilization . As for Iraq , and after the liberation of its people with all its diverse ethnic and religious components from the dictatorial regime, the A.D.O. in association with the Chaldo-Assyrian National Council and the other active political Assyrian forces in the national and Iraqi arena have set out to mobilize the honest national efforts through convening the General Conference (Chaldean , Syriac, Assyrian ) in Baghdad in October 2003. This conference was truly a national forum and an important landmark for the struggle of our people in Iraq to attain their national rights in a new, democratic and unified Iraq . The conference highlighted the unity of the national identity of our peoples in relation to their nomination, culture and language. It also jointly raised its political, cultural and administrative demands as an original people as well as their common vision as to what the political system in the new Iraq would be and further stressing their role as an important factor in the national Iraqi equation. After a long and difficult struggle the diverse political and ethnic Iraqi forces inside and outside the Governing Council could work out a transitional law (Transitional Constitution) last month which though fell short of the aspirations and expectations of the Iraqi people, but still can be considered a positive document laying the foundation for a free democratic and diverse Iraq . This document may temporarily meet the minimum aspirations of the Iraqi people with its different nationalities: Arabs, Assyrians (Chaldeans, Syriacs ), Kurds, Turkmen and others, and will pave the way to get rid of the prevailing anarchy, absence of security and stability as well as the occupation, ending up with achieving complete sovereignty after holding democratic elections, forming the constitutional institutions and completing the permanent constitution which we hope will be democratic, secular stressing the unity of Iraqi land and people and acknowledging our people’s rights as an original people and further guaranteeing all its national rights equally with its other national characteristics . The presence of our people today in their historical areas in the southeast Turkey is threatened and their population remains continuously decreasing as a direct and indirect result of the genocide perpetrated during the First World War by the Turks . The A.D.O. demands that the Turkish government admit to its responsibility for these massacres which claimed the lives of half a million of innocent civilians as well as the lives of one and a half million Armenian friends . Further, the A.D.O. demands that the European Union's acceptance of Turkey as a full member in the EU be conditional upon the Turkish government’s acknowledgment of its legal responsibility for the genocide and acceptance of all the binding obligations according to the international law resulting from this acknowledgement, such as the right of return, reclaiming the possessions, compensations and the legal and constitutional guarantees for their national rights, in addition to a formal apology to the Assyrian people for the genocide which is considered a crime against humanity . In spite of the challenges threatening our people such as assimilation, loss of cultural identity, language and traditions, the A.D.O. 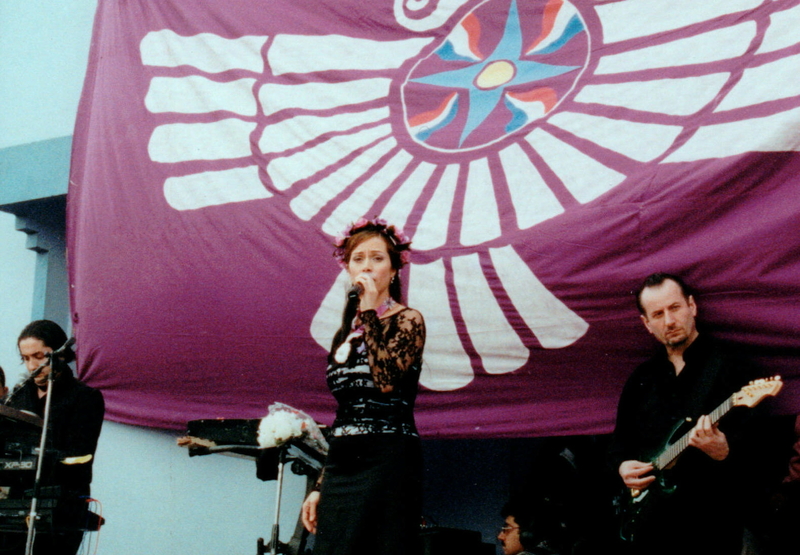 throughout its branches in the Diaspora is doing its best to activate its cultural and social organizations as instruments for preserving its identity and existence and as a strong foundation for the homeland and the cause of our people in it, and further as a means of extending bridges and strengthening economic social and political ties . Finally out of the spirit of this occasion which is a part of our country’s civilized legacy, an occasion which we hope will become a national day in the near future, we extend to all our people in the homeland and the Diaspora as well as to our partners in the homeland our warmest congratulations hoping that the new year will be a year of peace and stability for our region, homeland and our people . (ZNDA: Baghdad) On 31 March the Ministry of High Education and Scientific Research in Iraq approved the request to open a Syriac Language Division at the College of Languages of the University of Baghdad, effective September 2004. The approval was signed by Mr. Muhyi Kadhim al-Khateeb, Secretary General of the Iraqi Governing Council on 30 2004. (ZNDA: Damascus) More than 600 Iraqi and Syrian Assyrians celebrated the arrival of the new year last Thursday with many hoisting Assyrian flags at a restaurant on the outskirts of Damascus, the Syrian capital. Attendance included the Iraqi ambassador who is in charge of Iraqi interests in Syria and the Iraqi vocalist, Sa’adoun Jaber, who sang two of his most famous songs during the April First party. To the applause of the attendees, the Syrian Assyrian singer Emanuel Eskandar revived the old Assyrian nationalist songs with the Assyrian folklore band dancing in their traditional costumes. The efforts exerted by Emanuel Khoshaba, Assyrian Democratic Movement’s representative in Damascus, to make celebrations possible in the Syrian capital were remarkable. “We should not pass a year without celebrating Kha b'Nissan although many martyrs fell for the sake of freedom in Iraq,” Khoshaba told Zinda Magazine. Terana Hormiz al-Teyyari, 23, who fled Baghdad days before the U.S.-led war on Iraq in March 2003, said she was celebrating Kha Bnissan for the first ever time. “Saddam Hussein made us forget all four seasons,” Teyyari said. The celebration was marked with heavy attendance by journalists. The Associated Press, The Agence France Press, Reuters, and the Moroccan News Agency and many others were present in the festivity. The Arabic-language London-based al-Sharq al-Awsat Newspaper published a photo showing an Assyrian girl celebrating the New Year, 6754. Also, the Lebanese Daily Star newspaper published another photo on the occasion. Meanwhile, celebrations were called off in Baghdad and Syria’s northeastern cities of Hasaka and Qamishli for security reasons. In Baghdad, insurgency against the U.S.-led coalition troops was rising, while Kurdish riots last month in northeastern Syrian cities made it difficult for Assyrians to gather in large numbers. (ZNDA: Baghdad) Two tear-shaped drops of blood remained on the living-room floor, days after Muslim fanatics shot their way into a home and executed two children because the family is Christian. Now, some Iraqi Chaldean Christians say they fear that militants will attack churches in Baghdad on Easter Sunday. "They say, 'You have to be a Muslim, or else we will kill you.'" Late last month, the family of the two murdered children received a note warning that they would be killed and "doomed to hell." The next day, the gunman came and killed the two children, each with an AK-47 rifle shot to the head that left blood flowing across the living room. Their mother and several other children in the house were allowed to live, presumably to tell others. Some blood remains on the floor and wall, where a framed picture of the Virgin Mary with a golden halo looks out over the room. Mr. Barnsavm said: "There have been hundreds of attacks. Every day we hear of a new attack." He estimated that up to 200 Iraqi Christians have been killed by Muslim extremists since the war began last year. Many have been killed while working as interpreters for the coalition, in attacks that had no apparent religious motive. But Mr. Barnsavm says he is especially worried about incidents in which people are targeted simply because they are Christian. A public information officer said the case of the murdered children was a matter for the Iraqi Interior Ministry to take up as a "police case, such as breaking and entering or murder." the coalition. "They won't even allow me into the CPA building because I have no badge," said one senior party official, who asked not to be named. Chaldean Christians are said to number about 600,000 in Iraq, with at least twice that many having emigrated to the United States, Western Europe and Australia over the years. A large Chaldean community thrives in Southfield, Mich.
represented on the 25-member Iraqi Governing Council, which was appointed by the chief U.S. administrator, L. Paul Bremer. The one non-Muslim member of the council, Yonadam Kanna, represents Assyrian Christians, the smallest of three main Christian groups. A third group, Syriac Christians, is divided into Catholics loyal to Rome and Orthodox members with a patriarch. Iraq's interim constitution was accepted by the Iraqi Governing Council. But 12 of 25 members did so under protest and demanded there be changes after June 30, when the document takes effect. The constitution proclaims Islam the state religion. Elsewhere, it mentions Turkmen and Chaldo-Assyrians as examples of minorities whose rights are to be protected. "It doesn't say what a Chaldo-Assyrian is. We never heard the term before. Is it a nation? Is it an ethnic group, a religion?" asked Nahrain Kohoshaba Toma, leader of the Bethnahrain Free Woman's Union of Iraq. "We need to work with coalition forces to provide some sort of security for Christian families. Arab have clans. They have security from their clans. Kurds have clans. Christians don't have clans. They need security, and it starts with the law. Read the new constitution; it does not even say that Christians exist in Iraq," Miss Toma said. Mr. Barnsavm said a religious war is already under way in Iraq. He sometimes uses the terms "clash of cultures" and "clash of civilizations" terms that U.S. officials avoid. "On one side there's globalization, the borderless world, the concept of democracy, culture that flows across borders. Now the central power against this new system comes from the Middle East, from the Islamic fanatics and a tribal culture. "This is not just the Muslims against Christians. It's the fanatical Islamists striking the West. The Kurds near the Iranian border are being attacked by Ansar al-Islam, which says they are not real Muslims. "But the fanatics see us as part of the West, so we become the first target inside the country," Mr. Barnsavm said. Saddam Hussein's government gave a measure of protection to Christians and other religious minorities. None among dozens of Christians interviewed in the past month suggested they miss him. "We are quite happy that Saddam is gone, to end the rule of such a dictator," Mr. Barnsavm said. "The attacks that are happening to us are the price we pay for a new system, ending a dictatorship and building a new system. "We paid for these kinds of changes throughout history with our blood, every time in history there was a conflict between East and West." Much of the blood spilled by Muslim fanatics in post-Saddam Iraq has been from Mandeans, a Biblical sect known for its white robes, river baptisms and devotion to the teachings of John the Baptist. "After the war, we have documented 49 kidnappings, killings and rapes against Mandeans in different parts of Iraq," said Karam Majeed, who is creating an organization to preserve Mandean culture. Shortly after the war, a senior Muslim cleric based in southern Iraq published a fatwa, or religious edict, on his Web site: "When we consider Mandeans, we don't know much about their religion, but they are unclean." Said Mr. Majeed: "This is a very dangerous order because it means a Muslim cannot have contact with a Mandean. It also means that Muslims have the right to attack Mandeans. They don't consider it a crime to attack someone who is 'unclean.'" He read from a dossier of attacks during the past year: In Sadr City, a vast Shi'ite slum that houses more than half of Baghdad's 5 million people, gunshots were fired into shops owned by Mandeans and the words "your day is coming" were written on a wall. A woman in Baghdad was handed a note that read: "You are a Mandean, so you must pay 1 million Iraqi dinars , or we will kill your three daughters." In Falluja, the stronghold of Sunni Muslim insurgence a city now sealed off by U.S. Marines after the murder-mutilation of four Americans last week Mandean families have been forced to convert to Islam. If they refuse, they must leave Falluja or be killed. In the city of Kut, five houses owned by Mandeans were blown up, one last April and four in June. The police are typically of little help, and little effort is made to differentiate between common crime and attacks motivated by religion. When people are kidnapped for ransom a crime that has become commonplace but was unheard of in Saddam's time police often tell families of whatever religious faith to pay the kidnappers because there is nothing they can do. As for crimes with a clear religious motive, the situation is even worse, said Mr. Majeed. "We can't even go to the Interior Ministry. They won't even admit there is Islamic persecution of minority religions. The only people who can do anything about this are the Americans." The spiritual leader of the Mandeans, Satar Jabar, who has a long white beard, has written several letters to Mr. Bremer but received no response. "We don't have representation in the Governing Council or any of the ministries. They didn't ask us for anything," Mr. Jabar said. As for the family of the two murdered children, an aid group took the father to Amman, Jordan, and two uncles moved in to guard the wife and children, whose shy smiles belie their recurring nightmares of the attackers coming back. The Arabic paper Azzaman published an interview by Mr. Midhat al-Bazi with both Dr. Sa'eed Estifan, the President of the Assyrian Aid Society - Australia (AAS), and Mr. Nabil Karim, the President of the Assyrian Australian Academic Society (TAAAS). In that interview, the AAS - Australia and TAAAS reported that they are involved in a joint project to build a cultural and civic center in the town of Tel-Esqof, in the Nineveh Plain. The Nineveh Plain extends from north of the city of Mosul to Alqosh and is home for many Chaldo-Assyrian villages. In these villages alone live over 100,000 Chaldo-Assyrians. The idea of a cultural and civic center in the Nineveh Plain has been discussed and approved with the Assyrian Aid Society - Iraq. The center will be the home of many cultural and civic activities from the Chaldo-Assyrian youth living in the villages and towns of Telkepe, Batnaya, Baqofa, Tellesqof, Sharafiya, Bendwaya, 'Ain Baqra, Dashqotan, and Alqosh. The fundraising for this center has begun already. Last year Nineveh Club donated $4,000 towards the project. The AAS - Australia and TAAAS are planning a joint charitable festival on April 17 and all the proceeds of this event will go towards this center. Many Australian dignitaries will attend the festival, including the Governor of New South Wales, a number of members from the Federal Government Parliament, and some members of the New South Wales Parliament. 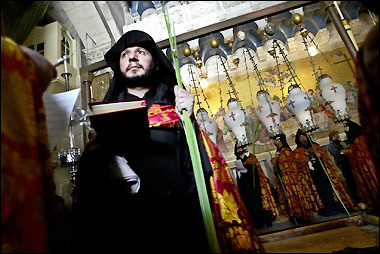 (ZNDA: Jerusalem) Hundreds of followers from different branches of Christianity began Easter celebrations Sunday by parading through the streets of Jerusalem's Old City before praying at the Church of the Holy Sepulchre. 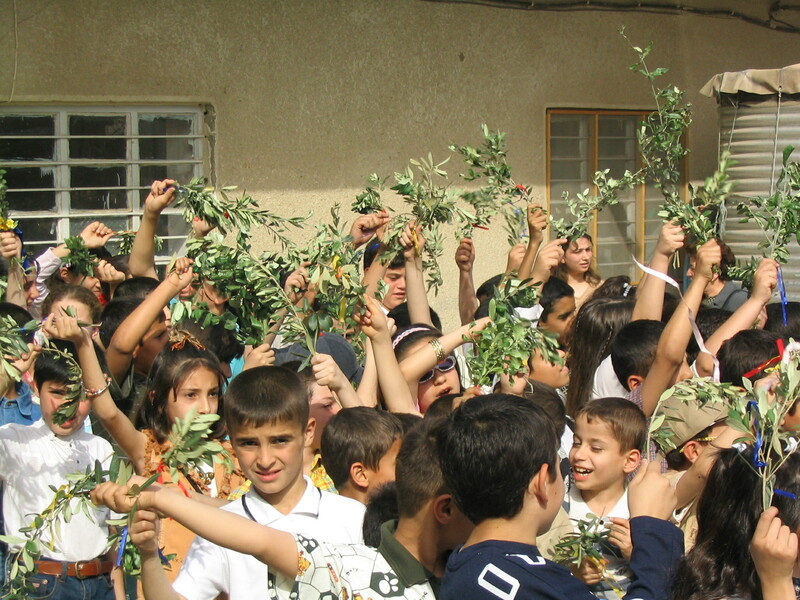 Groups of Boy Scouts from the Catholic, Armenian, Greek Orthodox and Assyrian communities banged drums, followed by crowds shouting "Hosannah" and waving palm fronds and olive branches to mark Palm Sunday. They congregated at the Church of the Holy Sepulchre, believed to the final resting place of Jesus Christ, for a special service. Palm Sunday marks the Sunday before Easter, when Jesus is said to have ridden a donkey down the Mount of Olives and into the holy city to a joyous welcome from the crowds, who scarcely a week later were calling for his death. Numbers were markedly down on the levels seen before the start of the Palestinian intifada, or uprising, in September 2000, which has seen many tourists steer clear of the Holy Land. Many Palestinian Christians have also been unable to attend celebrations, with Israeli authorities restricting travel from the occupied territories. One Arab resident of Jerusalem said she had been hoping that the rest of her family, who live near the West Bank town of Ramallah, would have been able to join her. "None of my brothers and or sisters have been able to come to Jerusalem," said the woman who would only give her name as Labiba. "Our family was meant to come and celebrate together and pray together. The Israelis said they would allow Palestinians to come but this is not true." (ZNDA: Sydney) [The Assyrian] entrepreneur Karl Suleman was a conman, but his lies didn't hurt anyone, his lawyer told a Sydney court today, arguing he gave financiers a tidy profit after fraudulently getting a $2.3 million loan for a $3.3 million luxury yacht which was sold for about $2.4 million. "Mr Suleman was a conman,", Bruce Stratton, QC, told the Sydney District Court. "He has conned these people into making money." On March 5, a NSW District Court jury found Suleman guilty of fraud. Four charges had been laid against the Froggy.com founder following an Australian Securities and Investments Commission investigation into Karl Suleman Enterprises (KSE) and businesses in the Froggy group. The jury in his trial was told that he lied to finance brokers and exaggerated his wealth to obtain loans of nearly $3 million for two Ferrari cars and a Princess motor yacht. Mr Stratton said the finance companies bought the cars and the yacht and Suleman hired them while making regular payments and never intended to defraud the lender. Suleman obtained full finance for the $355,000 Ferrari Spider convertible in December 2000, after falsely claiming to have $14 million in a joint bank account with his wife. The vehicle was later sold for $256,000. He also received a full loan for a $250,000 Modena Ferrari in October 2001, after telling a broker he had $18 million in the bank. This one later sold for $297,000. "Who is the victim in these crimes?" Mr Stratton asked Judge Peter Bergman during sentencing submissions for Suleman. "Nobody, your honour," Stratton said. "There was no breach of any position of trust as is very often the case in so called white-collar crime." Mr Stratton said there was no precedent of full-time jail sentences for white-collar criminals and any custodial sentence should be suspended. But Crown prosecutor Maria Cinque referred to cases where businesspeople had received prison terms for fraud and said Suleman still hadn't taken any responsibility for his role in the Froggy group's demise. Mr Stratton argued Suleman would have obtained the loans without having to use false bank statements had he just presented KSE's true financial situation and details of his other assets. "At the time that he presented that ... bank statement he intended that the financier lend him money that it otherwise would not have lent," she said. The case is the latest in a string of court actions against the failed dotcom entrepreneur. KSE and several Froggy companies were placed into liquidation in December 2001. 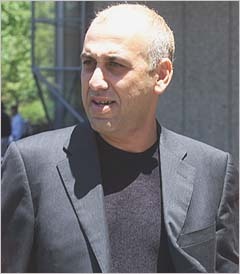 In May 2002, Suleman was banned for life from being a company director after the NSW Supreme Court found KSE had operated an unregistered management scheme. Investors, many with links to Sydney's Assyrian community, were left more than $80 million out of pocket. In July 2002, the court ordered Suleman to pay $17.4 million in damages to KSE. Suleman is in jail awaiting sentence on April 15. (ZNDA: Sacramento) On 2 April the city of Sacramento, capitol of the state of California, announced this year's recipient of its top modeling award as the young Assyrian from Modesto, Ms. Nahrain Toma. Ms. Toma was one of the final five contestants in the Tyra Banks modeling search and was on Good Morning Sacramento live. She will be featured on the Sacramento Magazine and fly out to Seattle and meet a Model agent. Ms. Toma will also receive among many prizes, a $5000 sponsorship from John Robert Powers modeling Agency. On 2 April, the famous Assyrian writer, journalist, and the author of the extraordinary documentary novel "Assyrians in Siberia", Ilya Vartanov passed away after a long battle with cancer. May he rest in peace, the devoted and allegiant son of his people, who himself went through all the misfortunes and grief that fell upon the Assyrian people in the Soviet Union. The funeral service will be held on 7 April in Moscow at the Mitinsckiy Cemetry. We will always remember Ilya Vartanov. His wonderful work will always stay in the hearts of the Assyrians around the world. I don’t understand why we have some Assyrians obsessed with His Holiness Mar Dinkha? It’s true that he is a spiritual leader of our nation, but he is not our national leader, or some General to do our fighting for us. Iraq is not a place for some peaceful and rational man. Mar Dinkha cannot handle what is going on in Iraq today. Let's not get religion mixed up with politics. Where has our Church gotten us for the past few hundred years? The answer is obvious, no place but backward. We don’t need to have more of our Church leaders in Iraq or the Middle East playing politics with our nation. We need professional and seasoned politicians in the Middle East. We need politicians who can broker a better deal for the future of our people. We need people that have good contacts in the United States, Great Britain and other major players. Anyone asking His Holiness Mar Dinkha to go back should go back him/herself. If anyone should go back is our political leaders in theDiaspora. They need to go back and straighten this mess we are in now. We have no national recognition in the Iraqi constitution. We do not have a protective zone like the one the Kurds have. There is nothing mentioned about our indigenous right or history in Iraq. We are recognized merely as Christians and nothing else. The only post given to us was the Ministry of Transportation. We had a better post under Saddam Hussein. We can’t even agree on what we should be called, because of our Churches’ involvement in politics. We are the laughing stock of Iraq. We can’t even agree on the breadcrumbs that the Arabs and Kurds throw at us. Please keep religion and the religious leaders out of politics. After this desaster for the Assyrien nation in our mother country of Bet Nahrin it is time to find new ways to sport our nation and our name. One idea is to think about one international Assyrian parliament. To contact us in Armenia please write to atour@atour.am or call us in Yerevan at (374-1) 56 51 51. 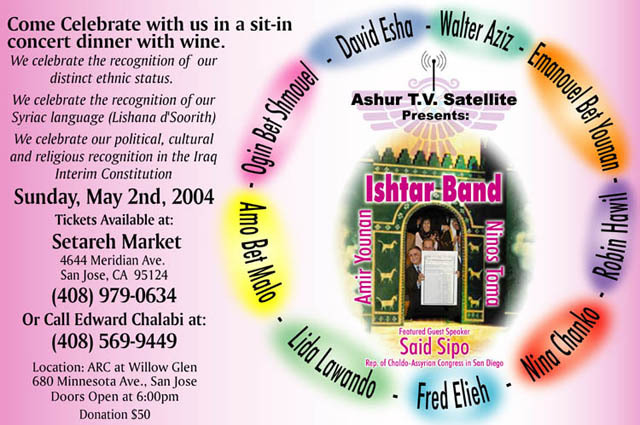 To the people who are organizing the Ashur T.V program celebration on the 2nd of May. Where is the name of the pioneer entertainer Linda George?... Was she forgotten at the T.V station, that I watched its program due to her amazing pipes and courageous speeches in our home land. I urge for an answer. I would like to offer a small correction to the article entitled "Ishtar Eggs and Tammuz Trees." In the article, a claim is made that in Acts 12:4 the word "Easter" is present. Actually, that reading exists only in the King James version. In both the original Aramaic and Greek manuscripts, the word used is "Paskha", which of course is "Passover" in English. For some unknown reason, the translators of the English King James version translated this word as "Easter", even though in all other verses that contain this word, they translated it as "Passover." Of course, the New Testament was not originally penned in English and we should check the original sources! Again, both the original Aramaic and the later Greek translations of the New Testament have "Paskha" in Acts 12:4..... NOT "Easter" in any sense of the word. The Jewish king Herod Agrippa, according to the Jewish historian Josephus, was a conspicuous observer of the Jewish customs and rituals, and since he was attempting to please the Jews (Acts 12:3), it is obvious that this verse is referring to the Jewish Passover, not any sort of celebration dealing with Ishtar and Tammuz. I am an Assyrian who didn’t have the privilege to be born in Assyria, but I was born in an Assyrian home not too far from Assyria. I am proud of my heritage, and as far as I can trace back my ancestors, all were Assyrian, so I will die an Assyrian. I have come to realize that there will be no Assyria in my lifetime or ever. This is a result of us constantly following the same pitiful ways and us being grateful for those who try to keep us happy with so called “new strategies,” that our nation is all too familiar with. With the rise of the Iraqi crisis, this was supposed to be our golden opportunity to ask for a small piece of land, that belongs to us in the first place, where we can live in peace and without fear of being massacred again. It is amazing that everywhere you dig in what is now going to be Kurdistan, you find the bones of our ancestors, yet we have no claim to any part of it. I have to thank our leaders, political organizations, and the churches for being fast asleep and not ready for this day, we have no one to blame but ourselves. Not only did we not get what the rest of Iraq got, but also now we have Chaldo-Ashour as our new name. The reason for this was that there were not enough people, so we had to modify our name to show that we have a larger population than we really are. While we are at it, why not change our name to Shiite-Ashour or Turkoman-Ashur, that is an even bigger number. Just look around at the small Gulf States that the west has created, their overall population is nowhere near that of the Assyrians. So what do numbers have to do with this situation, is this some new politics or a new game for the unfortunate Assyrians. The right of self-determination of indigenous people is a pillar of international law. As the indigenous people of Iraq we should impose our rights under these laws. A nations name is not clothing that you can change for every new occasion. Assyria is sacred to us Assyrians. God has given us this and even he himself cannot change it. Who has given you the power to play with our name and language? The Iraqi people know who the Assyrian are and so does the rest of the world; we are the only ones that are confused. Every time some one from outside Iraq criticizes these so called leaders in Iraq, their answer is “why don’t you come in here and work”, “we are in the war zone”, “we know what we are doing.” These are the same people who are not shy to ask for financial support, so if they want our support then we must make our voices heard too. Taking into consideration the direction which Iraq is taking, if we as a nation do not stand our ground and demand our rights as a nation, we will be assimilated into Iraqi Christians and finally into Islam. The west is taking the same approach in Iraq as they do with Afghanistan, Iran, and any other Islamic state. In the Middle East they care less for the Assyrians and Christians, the west is only interested in their benefits in that region. The British know the mentality of the people in the that area and have been doing business there for a century. Just read the new Iraqi constitution, if it is supposed to be a democracy, why would an Islamic clause be included? The British fooled us before and it worked, so now they are doing it again. We cannot count on anybody but ourselves and I hope that our Martyrs' blood hunts down those who stand in our way. This year Mar Narsai Parish will participate in the grandest Easter morning tradition in the San Francisco Bay Area atop Mt. Davidson. Archdeacon Ninos Michael will perform the benediction in the Assyrian language. This will be one memorable event. Come and join us in the celebration of the resurrection of Christ our savior. Please Note: Dress very warm, wear comfortable walking shoes for the short walk to the summit, and bring Flashlight, folding picnic chair to sit on. Regular Easter Sunday Church Services remain unchanged at Mar Narsai Parish 9-10 AM, Candle Vigil- Easter Prayer Service followed by Qurbana Qadisha, followed by breakfast donated by Helen Icho and family. From Church:Drive SOUTH to SLOAT BLVD. Turn LEFT on SLOAT. Turn LEFT on PORTOLA DR. Turn RIGHT on MARNE. Turn RIGHT on DALEWOOD Way. Park gate located at the intersection of Lansdale Avenue, Myra Drive and Dalewood Drive. GOLDEN GATE BRIDGE to 19th AVENUE. Continue on 19th. Turn LEFT on SLOAT BLVD. Turn LEFT on PORTOLA DR. Turn RIGHT on MARNE. Turn RIGHT on DALEWOOD Way. Park gate located at the intersection of Lansdale Avenue, Myra Drive and Dalewood Drive. Take the I-280 NORTH exit towards San Francisco. Continue on CA-1 NORTH/19th Avenue towards GOLDEN GATE BRIDGE. Turn RIGHT on SLOAT BLVD. Turn LEFT on PORTOLA DR. Turn RIGHT on MARNE. Turn RIGHT on DALEWOOD Way. Park gate located at the intersection of Lansdale Avenue, Myra Drive and Dalewood Drive. Take BAY BRIDGE to San Francisco. Take the MISSION ST exit. Take the DUBOCE AVE/MISSION ST exit. Continue on DUBOCE AVE. Bear on MARKET ST. Continue on PORTOLA DR. Turn LEFT on MARNE. Turn RIGHT on DALEWOOD Way. Park gate located at the intersection of Lansdale Avenue, Myra Drive and Dalewood Drive. The Assyrian Athletic Club proudly presents the First Annual Winged Bull Reunion Dinner & Dance Saturday, 15 May 2004. Location: The Golden Fawn in Chicago, honoring the Assyrian soccer (football) legend, Douglas Aziz. Admission will be FREE for all registered Winged Bull players and one guest. Each registered member will also receive a Membership Gift Package courtesy of AAC and our sponsors. Admission for other guests is $50. We are pleased to announce that the AAA RNSS rules and guidelines have recently been amended by the RNSS committee and approved by the AAA. For those of you who may not know, the AAA RNSS was established in 1986, to reward each year scholarships to 3 Assyrian students who successfully completed their Higher School Certificate in NSW and qualified for entry into a NSW University, and who obtained the top 3 HSC results amongst Assyrian applicants for that year. The scholarship award, up until the end of 2003, was $500 for First Place, $300 for Second Place and $200 for Third Place, with a consolation prize to the runner up. Upon successful renewal of their application, the recipients received an annual amount of $500 for the remainder of their course of study. The new rules and guidelines which came into force this year have increased the awards to $1,000 for First Place, $800 for Second Place and $500 for Third Place. The Scholarship will only be awarded to the successful recipients for the first year of their tertiary studies. We encourage all Assyrian students in Sydney who completed their High School Credentials in 2003 and who are currently enrolled in a University Course in NSW to apply for this year's Scholarship Awards, regardless of your UAI result! Application forms are available from Nineveh Club Reception, Edensor Road, Bonnyrigg NSW. For further information, please contact the Secretary of the RNSS Committee, Ms. Nora Michael, on 0400 424 303. Applications are now open for the Assyrian Australian Association Rabi Nemrod Simono Scholarship 2004. The Assyrian Food Festival will be held on April 24 & 25 at the Assyrian Church of the East grounds in Tarzana, California. The church is located on 5955 Lindley Ave. The entrance for this festivity is free. Different varities of Assyrian and international food will be available. Entertainment will be provided by Ogin, Ashour Bet Sargis, Tamras Tamras, Linda Lavando and Yourik. Please come and join us. If you need anymore information please contact the church office at 818-996-6604. A crowded Assyrian community gathered on Sunday, April 4th in a parade on King Sargon Boulevard (Western Avenue, between Peterson and Pratt), celebrating the Assyrian New Year, commemorating the 6754th Assyrian year. Kha B’Nissan, the first of April, marks the beginning of life and fertility. In the hymns of the ancient Sumer, luminous Inanna is poetically described as queen of heaven, radiant start and first daughter of the moon. Often depicted by the goddess’ side is her beloved husband, Demuzzi, the majestic sun. The couple chose New Year’s Day, an auspicious time of new beginnings, for their marriage. After the ceremony, Demuzzi drew close to Inanna and quietly presented her with gifts representing fertility, creativity and abundance. Because of her capacity for joy, gentleness, strength and bravery, the spirit of Inanna is lovingly described in one epic after another as a great light filling the sky. By coming together and thus becoming one, she and Demuzzi inspired poetry and art, balance and harmony to the people of Sumer. The mother goddess Inanna is the Sumerian counterpart to the Babylonian goddess Ishtar. One of the most revered deities of the ancient Near East, the Bablyonian creator goddess Ishtar (giver of Light) was associated particularly with love, war, fertility, childbirth, healing, and justice. Ishtar had equivalents in numerous cultures, including the Zidonian goddess Ashtoreth, and she gradually appropriated the identities of other goddesses. The story of Ishtar’s descent to the underworld, which follows, links her to the Greek goddesses Demeter and Persephone. Ishtar was the wife of Tammuz, the vegetation god. Upon his death, she ventured to the underworld to restore him to life. On her journey, she passed through seven gates, removing one of her veils at each gate. She was gone for so long that nothing grew on earth during her absence. This situation prompted the other deities to help her procure Tammuz’s release. As part of the bargain made with Allat, ruler of the underworld, Ishtar had to return once a year to repeat the ritual of her husband’s death and rebirth. Today, Assyrians gather to celebrate the same rituals that were practiced by the first recorded human civilization, the Sumerians. Assyrians in Chicago, approximately 120,000 in population, are an immigrant generation from predominantly Iraq, Iran, Syria and Lebanon, and other Middle Eastern countries. The Assyrians of Chicago are good, contributing citizens to the business and commerce in the West Rogers Park and Andersonville communities, as well as neighboring suburbs of Lincolnwood, Skokie, Morton Grove, Niles and Des Plaines. Other Assyrians have established smaller communities in Elgin, Roselle, Schaumburg, Elk Grove, and other Northwest Suburbs. While outnumbered by other minority groups in the United States, Assyrians have steadfastly progressed to higher education in the fields of law, finance, medicine and politics. Assyrians in Chicago are among the most unique people of all the Assyrian communities throughout the United States. Interestingly, they have the vibrancy for maintaining tradition and folklore through their close knit community resources and churches. In an essence, the Assyrians have become a sub-culture streamlining into the American culture. Moving into the 21st century, newcomers continue to migrate to the Chicago land area, leaving behind family and friends (death) in a pursuit of new beginnings (rebirth), calling Chicago their new home. We salute our rich heritage and welcome a new birth to yet another spring season with hopes for new and better beginnings in the life of our small beloved Assyrian community. The geography books in France describe her, as 55 million Frenchmen. In other words, the Frenchmen make France, and not the other way around. In his "L'Homme aux quarante écus" Voltaire derives to the conclusion that by dividing the GNP of the 18th century France into the number of its inhabitants, a Frenchman thus, becomes a person of 40 Francs. To the disdain of many, this nomenclature is menacing and insulting. However, it is a more respectable manner to point to someone than merely saying: Nobody. The past nine decades kept Assyria in the pits. She tried to practice its emancipation, in the 20th century, from subjected cognizance to freedom and liberty, to no avail. Assyria organized itself, mobilized and sacrificed both its citizens, and its combatants, fought its battles on both the diplomatic and combative fronts, but, just as she did for the past 2500 years, Assyria ended up bereft of victory, of any sort. Suddenly, to the astonishment of the world opinion, in the world of politicvs and intrigues, an opportune moment rose up for Assyria to grasp hold of its assets--the international community of both Assyrians and non-Assyrians--who were clamoring the drums of liberty and justice for all, unfortunately, once again, just as all the times before, Assyria chose to follow the path of stagnancy, by placing its trust in the hands of a singular voice. Once again, Assyria relied on benignancy of usurpers, who are no less than puppets of the same international community that waged war against the tyranny in the name of freedom and democracy. Hence, in lieu of fomenting a cohesive internationally powerful political and an administrative international body for attainment of its rights and/or at least, its self-respect if not determination, Assyria opted for a vigilant mainstay of the events, by surrendering the national hegemony to a single apparatus of vociferous but ignoble elements. These elements, although rising from within--through malice or ignorance--followed, and/or were forced to abide by the wretched powers that concoct and divide the subjugated inhabitants and occupied territories for their own benefit, without the slightest of reverences for law, freedom, justice, fairness, civilization, and humanity. As a result, Assyria ended up eschewing its distinctive nomenclature, its language, its legal rights to the lands of their ancestors, and its voice--that is representation--in the world. A nation, in any form or shape, is still a nation as long as it clings to its culture, language, distinction of heritage, and a sense of a nationalistic fervor. Such a nation MUST not and cannot allow, becoming a tool in the hands of a singular person, a singular political party, a singular ecclesiastic denomination, and a singular dogma. In war or in peace, although united in their goals, the nations still cherish waging the opinions and following the paths of livelihood and thoughts. To imbrue unity at all costs, is to take absence of liberty. It is the physical unity rather than idealistic that is preponderant in the face of a fatalistic event. However, just as in most parts of the world-even at the present-this essentially logical concept has been eradicated, and replenished with bombastic demeanor of treason with penal consequences. 5. Assyria is not ALONE. There are Assyrians in the whole world to proclaim Assyria. There are Assyrians in the whole world to work for Assyria. Just like the Frenchmen form France, Assyrians form Assyria. Assyria, although robbed of its territory, its identity, its representation, its name, its language, its culture, its dignity, shall remain Assyria, as long as there are Assyrians. Hence, just as a precedent of March 25, 2004 in Ottawa, when 'Assyria National Appeal' was presented to the House of Commons of Canada,by the Assyrian Canadian Lobby Committee, Assyria is fomenting an international scale, to launch the 'Assyria International Appeal'. (ZNDA: Cairo) Mel Gibson's big screen depiction of Jesus' final hours has been embraced by Arab Muslims and Christians alike, with some dismissing allegations "The Passion of the Christ" is anti-Jewish and others making clear such charges are part of its appeal. In this part of the world, anti-Semitic speech is often portrayed and accepted as an inevitable byproduct of Arab anger at Israel. Palestinian leader Yasser Arafat, after watching "The Passion" in the West Bank, compared Jesus' pain during crucifixion to Palestinians' suffering in the conflict with Israel. In the United States, charges "The Passion" was anti-Semitic or that its graphic depiction of Christ's crucifixion could fuel anti-Semitism sparked an uproar even before the movie's commercial release. Gibson denied the film was anti-Semitic and said it was unfairly prejudged. The New Yorker magazine called "The Passion" a "deeply angry" film that"changed in small ways a number of things from the Gospels and ignored what historians know of ancient Judea, all with the result of making the Jewish leaders more, and the Roman leaders less, responsible for the death of Christ." But The New York Times said: "Despite concerns about the anti-Semitism of Mr. Gibson's portrayal of the Pharisees, the movie is more grueling and unnerving than outrageous or offensive." In places like Jordan, Syria and Lebanon where the film opened in March, it has drawn large and enthusiastic crowds. Elsewhere, Arabs eagerly await its release. A top Shiite cleric in Kuwait, Ayatollah Mohammed Baqer al-Mehri, has urged his government to let the film be shown in theaters there because it "reveals crimes committed by Jews against Christ." Films with Christian themes are not usually shown in conservative Muslim Kuwait. Besides, a strict interpretation of Islam forbids artistic portrayals of the prophets, and Muslims revere Jesus as a prophet _but do not consider him the son of God or accept the story of the crucifixion and resurrection. The dean of Kuwait University's Islamic Law College, Mohammed al-Tabtabai, has issued a fatwa, or religious edict, that Muslims shouldn't watch "The Passion" because Muslims reject the idea of an actor portraying Jesus. Pirated copies of the film are nonetheless being circulated in Kuwait. Bahrain banned "The Passion" because it depicts Jesus, according to that Gulf nation's Information Ministry. The ban applies to movie theater screenings as well as tapes or DVDs. The Gibson movie opened Tuesday in Egypt, where the cartoon "Prince of Egypt" was banned because, among other reasons, it depicted the prophet Moses. Government censors made no changes but, because of its violence, said viewers must be at least 18, Nevine Refaat of Allied Film Distribution, one of the film's distributors in Egypt, told The Associated Press. Even before the big screen release here, some Egyptian churches and Christian bookshops have been selling compact discs of "The Passion" for less than a dollar. Egyptian Muslim clerics who might be expected to object were taking a hands-off approach. "My understanding is that it is about the last 12 hours in the life of the Christ, which involve Christians and Jews. Muslims have nothing to do with that," said Sheik Abdel Zaher Mohammed Abdel-Razeq, whose officeat Cairo's Al-Azhar University offers guidance on which films as well as books and other materials Muslims should watch. Abdel-Razeq said Al-Azhar, viewed as the pre-eminent seat of Sunni Muslim learning, rejects the portrayal of prophets on the screen, but would have no comment on "The Passion" unless "somebody brought it to us, or complained about it." Censors also have cleared the movie for release in the United Arab Emirates, where a Gulf News editorial recently gushed that "the film is so close to the human condition in its depiction of betrayal, greed, falsehood, forgiveness and love." In Lebanon, Cardinal Nasrallah Sfeir, head of the Maronite Church in Lebanon, had high praise for the film. "It is not exaggerated and portrays reality as it is. It is a very sad film and we did not feel there was any anti-Semitism there," Sfeir told reporters. The film is also playing in Syria, one of the few places in the world that still has speakers of Aramaic, the ancient language spoken by some characters in "The Passion." Salim Abraham, a 37-year-old Syrian Assyrian journalist who speaks fluent Aramaic, was among the first viewers. "I was so very happy to see my language, for the first time ever, being spoken on the big screen and in such a powerful movie," he said. "I think there is nothing anti-Semitic in it," he added. "It gives the facts as they are, though they may be slightly exaggerated in some instances." Montaha Kochou, fondly known as Mona to family and friends, introduces to the public, her first, romance fiction, entitled, 'Burning Desire'. The Assyrian native arrived in America in 1978 and developed a true love for the art in the sixth grade where she was ranked first out of 270 students in writing composition. This achievement gave Mona the confidence to begin story writing; consequently she has several novels finished and ready to be published. Coming from a rich cultural background has been an added advantage in writing 'Burning Desire' which focuses on a young Lebanese woman who arrives in America with the longing and desire for a man she barely knows. "I used my knowledge of the cultural differences as they affect women and men and the passion that women universally feel when they love." Mona has six siblings and has lived in Baghdad, Kuwait and Greece. "Being Assyrian gives me such confidence; the first library was founded in the great Assyrian Empire which existed some 6,000 years ago. Coming from that kind of historical heritage makes me proud and assured," says Mona. The characters in 'Burning Desire' were developed from the many countries and personalities that she has experienced during her travels. With a vivid imagination, Mona has combined love, intrigue and passion to create a thoroughly captivating first novel. Mona lives in Mount Prospect, Illinois with her husband Joseph Kochou, a handsome Assyrian man. They have three daughters, Josephine, Christine and Pauline. "Everyone in my family and community is excited for me since this book is like a child to me. It was a blessing from God. I gave birth to it, nurtured it, and now I hope everyone will say my baby [book] is beautiful," says Mona. Mona has just completed the sequel to 'Burning Desire' entitled, 'Will The Sun Rise Again' which deals more with the emotional and spiritual decisions people have to make when love doesn't go their way. For now, however, get ready to be captivated by 'Burning Desire. Release date September 2003. Burning Desire: is the tale of three daughters of extreme beauty and courage. Placed in the care of merciless relatives, Nadia, Joseline, and Vera grow into three distinctly different women, each with a vision of love until their bond is tested when desire in the form of three men enters their lives. Love, once such an innocent spurs lies, deception, and betrayal as Nadia faces a choice between the promises to the man she loves and the possibility of a future with an American. One by one each sister will face her truth and loss of innocence. From a city torn by religion and war comes the story of three women whose cultural differences and newly found freedom in America twist into a powerful story of love, hate, passion, and betrayal. This book is for anyone who has found, lost, and sacrificed under the intense heat of their own Burning Desire.